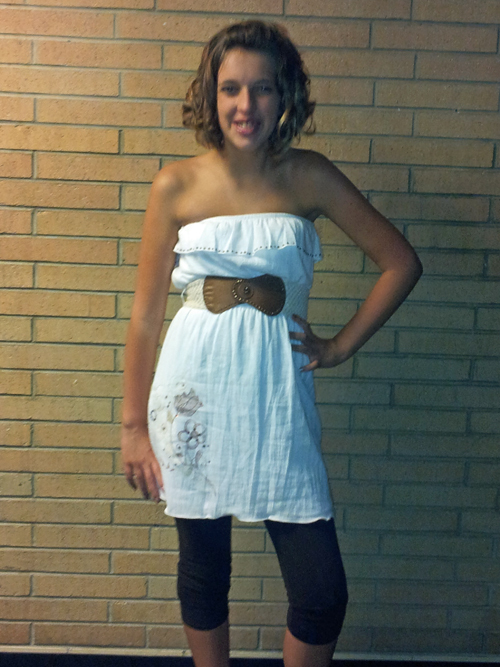 “Dress Up Your Duds” 4-H Competition: Shelby’s a Winner! 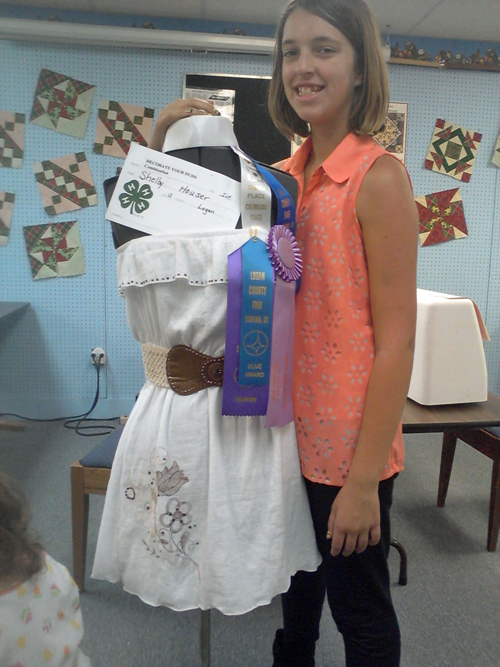 Here’s Shelby with her winning “Dress Up Your Duds” 4-H project. She took a long dress, cut it off, and narrow-hemmed the lower edge. The right front of the skirt is embellished with an embroidered and painted design with Shelby customized in BERNINA DesignWorks Software, changing some of the stitches in the original design to painted lines. She added glitz to some of the embroidered and painted design, along with the belt and top ruffle. At the Logan County Fair, Shelby received a Blue Ribbon for her interview, a Champion AWARD for class, and a Reserved Grand Champion Award overall. Her dress then went on to the Colorado State Fair where it won third place out of eighteen entries, winning Shelby yet another ribbon! 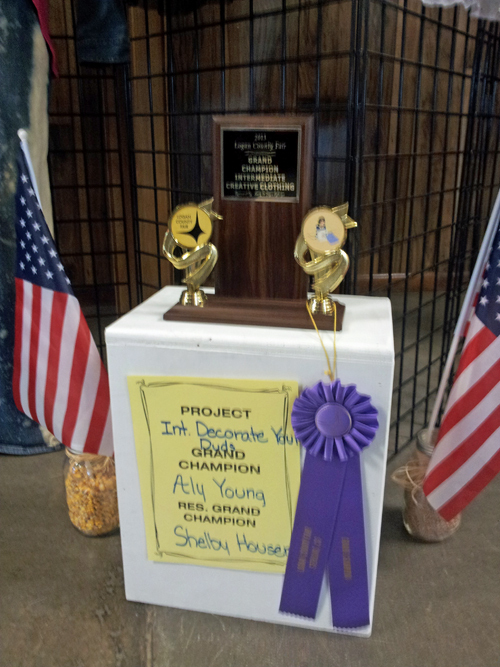 Everyone is very happy with the results, especially as this is Shelby’s first year in 4-H! Her mind is already buzzing with ideas for next year! Next Next post: WeAllSew Celebrates Our Loyal Fans! So cute. 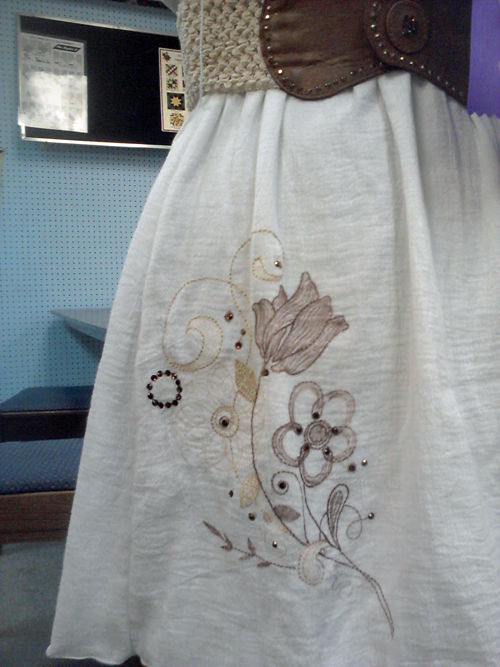 Repurposing a dress and adding the design is beautiful. Really glad young kids are enjoying the art of sewing and design. Well many years ago, i too learned to sew in 4h. We had to make a pincussion, a pair of slippers out of washcloths, and something else i dont remember. I just remember there were three projects. And when we were done with those and they were to the leader’s satisfaction… Lots of ripping and tearing and crying and resewing… Well we went on to the BIG project. That consisted of 4 items that all matched. A bulletin board, a waste paper basket, a pencil holder, and a pillow. I did mine without too much difficulty. It was all straight sewing. And gluing and lots of imagination. Well my daddy had the imagination. I tapped into that. He helped me with ideas on what to do and what it could look like, but i did every stitch. Well, it was fair time and by the time we made it there, well the judging was over and we walked into the right building but couldnt find all of my projects. The BIG project was missing … So we were hot!!! And we looked and looked. And just as we were going to find someone to get to the bottom of things, we turned around in the Best of Show arena and there were all four of my projects of the BIG project. 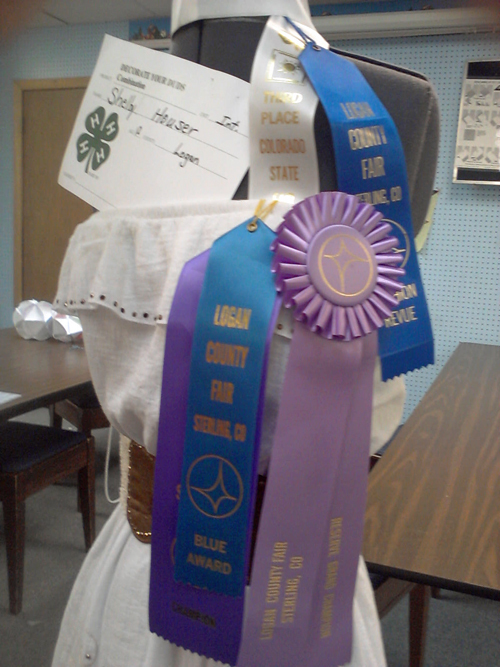 They all received blue ribbons, would have been the big purple ones but i wasnt old enough but i did have four out of seven projects in the Best of Show arena. That is pretty cool. Ive never forgotten that. It was quite an accomplishment for me. I never got recognition for anything really. But there i did, front and center. I also had received all blue ribbons except one red on those slippers. I remember just having an awful time working with those washcloths!!! Lol!!! But that time has come and gone and for the past around seven or eight years my grandma has had me quilting. I just love it. I dont do it everyday, but not a day goes by that im not plotting and planning my next quilt or quilts. Like right now im working on around three quilts in my head, i just got to get busy and begin stitching to catch up with where my head is at. Yep it sure is fun dreaming isnt it? U bet it is!!! I fell out back here and one thing i could do was make a quilt. And i did. I stitched every stitch i could by hand and then my grandma finished it for me because i wasnt allowed to have an iron in the old folks home and plus we wanted the binding and the quilt durable. Sew it is. And i gave that first quilt to my friend in the Richland Life Care Center. She was such a dear friend to me while i was in there. So yea, we all learn somewhere. I learned mostly from 4h. And quite a bit watching my grandma sew too. She is a Master Seamstress. She can sew anything. She makes her own patterns. She sews for her Lutheran church. Lots of beautiful banners and the pastors wear stoles and they need other things also. I know she does all of the big banners in there. She sews all on Berninas. She sold me my Bernina/Bernette. Then i liked mine so much i got a Bernina/Bernette for my daughter brand new. In all my life ive never had a brand new sewing machine. However she expressed a deephearted sincere desire to quilt and wanted to know if you can use those hand held stitchers. Well that broke my heart i sprung into action and got my mom to go in on it $100. I went in on it $160. It was such a great deal. Thats what i paid my grandma for a used machine. But it is still under warranty so it is cool. I love Bernina!!!!!!! !